Spring is coming to an end, and summer is rapidly approaching. With these seasonal changes come the relaxing walks and festive outdoor barbecues, but also the dreaded chore of mowing the lawn. 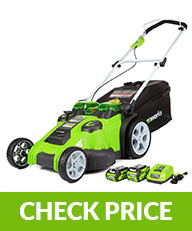 While you can’t take the chore out of mowing you can make it easier by buying the best lawn mower for your lawn. Whether you want a gas/electric, self-propelled/reel, corded/cordless mower our reviews and recommendations will answer all your questions. Here is the section everyone has been waiting for-our top selections for the best lawn mower to buy this year. As usual, we have broken down the list into categories for each type of push mower. These rankings reflect both our own opinions and the opinions of thousands of Amazon reviewers. Without further ado, here are the best mowers of the year! Who this is for: Someone who wants one of the best overall mowers available at an affordable price. Who this is not for: Someone who needs a lot of power, and frequently cuts rough or wet turf. Honda GCV160 160cc 4-Cycle Engine: This engine has the perfect amount of power for most lawns (see our Q&A “How much power do I need”). Additionally, it is not obnoxiously loud, so you won’t have to worry about annoying the neighbors with your early-morning mows. “Micro Cut” Twin Blades: With two blades oriented off-center to one another the mower produces a clean cut, and mulches the grass (when in mulching mode) into fine clippings. Variable Speed Rear Wheel Drive: The mower reaches a max speed of 4mph, and accelerates depending on how much pressure is placed on the handle: light pressure=slow speed/ firm pressure=fast speed. 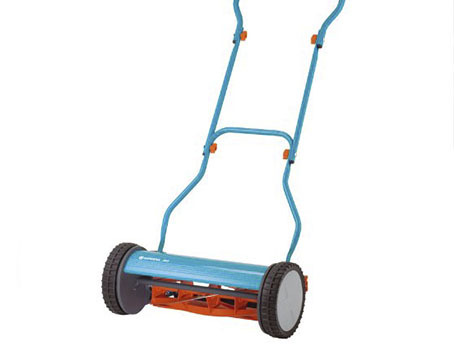 This allows you to accelerate on straight stretches of grass, and then easily slow down to cut the hard-to-reach areas. 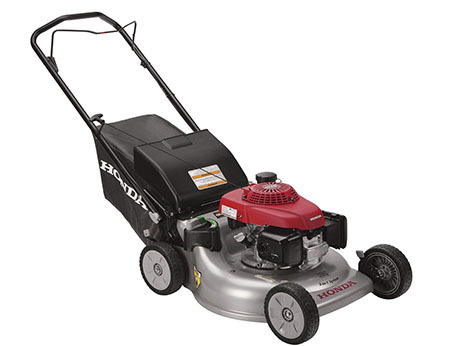 Honda mowers are legendary for their reliability, quality, and features-this mower is no exception. It leaves a remarkably clean cut (it can mulch or bag), and the engine is produced by Honda themselves (unlike with most other brands). With over 50 years of engine-making experience Honda truly deserves to receive our highest recommendation. Who this is for: Someone who wants the strongest push mower available and is willing to pay for it. 190cc Briggs and Stratton (B&S) Ready: Start TM Engine-Along with Honda, B&S produces exceptional engines. At 190cc the engine will help this mower power through the tallest/wettest of grasses with brutal effectiveness. Additionally, the engine is “ready-start TM” which means it does not require choking/priming. Hi-Vac TM mower deck: The unique shape of the deck creates a powerful vacuum underneath the mower. This vacuum ensures that almost all of the grass clippings are bagged. High capacity rear door grass bag: The 2.5 bushel bag is the perfect complement to the Hi-Vac’s (TM) ability to collect the maximum of grass clippings. The large volume bag means you won’t have to interrupt your mowing to empty a full bag. Snapper created the industry’s first rotary blade mower, and continues their tradition of excellence with this push mower. It is the most powerful gas push mower we review, and has the most effective method for sucking up lawn clippings. 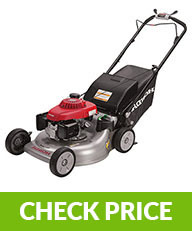 It may be on the pricier side, but with that extra price you are getting a lawn cutting powerhouse. Who this is for: A budget conscious consumer who needs to save space in their garage and time in their life. Who this is not for: Someone who has space for a non-folding mower, or can afford a more expensive mower. 190cc Briggs and Stratton Ready: Start TM Engine-One of the standout features of the Recycler is that it has the same engine as its more expensive counterpart the Snapper. 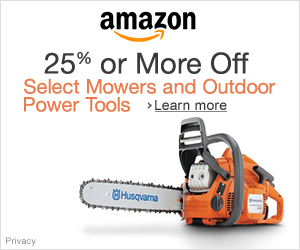 This means you are going to get a powerful mower at an empowering price. Smart Stow (TM): The Toro is made to be stored on the garage floor in a vertical position. It easily folds into a small package with supports that allow it to be balanced upright. It is important to note that no fluids will leak during storage. With smart stow (TM) there is no need to worry about the mower dominating garage space. Quick wash port(TM): The mower has a hose connection port on its underside, so cleaning built up grass deposits and grime from the bottom of the mower is a breeze. This Toro is a perfect everyman’s mower; it gets the job done without breaking the bank. Just because it is cheaper does not mean lower quality. Toro has added a variety of innovative features to simplify every aspect of the mowing experience. 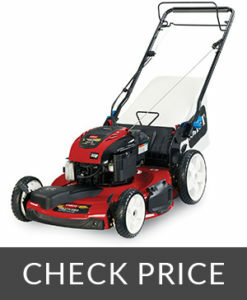 All that being said, the Toro is our pick for the best value for the money push mower. Who this is for: Someone who requires a standard power lawnmower and uses multiple lawn clipping discharge methods. Who this is not for: Someone who frequently cuts tall or wet grass, or uses a single method of clipping disposal. 163cc Briggs and Stratton Ready-Start TM Engine: We have discussed the B&S engines before and this one is no different. 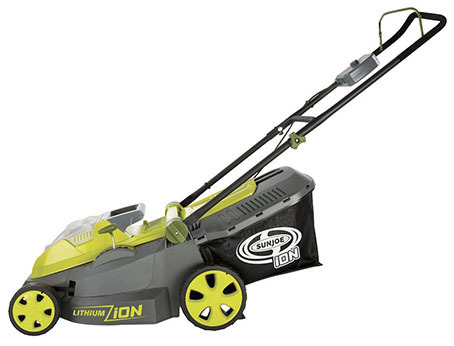 At 163cc it provides enough power for most lawns aside from the very tallest/wettest. Versatile 3-in-1 TM cutting deck: The Troy-Bilt allows the user to either mulch, side discharge, or bag the clippings (See “Lawn clipping disposal” under “What to look for in a mower” header). This flexibility means that the setup can be adjusted to fit the task at hand. For example, someone might use side discharge if he hadn’t cut the grass in a while and it has grew tall; the next week he would switch to mulching. Who this is for: Someone who wants to purchase an American made mower with easy to adjust features. Who this is not for: Someone who wants the most reliable engine possible, or requires additional power. Deep Domed deck: The curvature of the deck makes cutting tall or wet grasses (that might be difficult for a 159cc motor) easier. Easily adjustable height: To adjust the height simply push the bail (lever that you hold to move mower) downward. There is no need to unscrew or fidget with jammed levers. Variable speed rear wheel drive: Like the Honda the Ariens mower speed can be dynamically changed based on how much pressure is applied to the bail. Ariens is a classic American manufacturer which has been producing quality lawn and snow removal equipment since 1933. 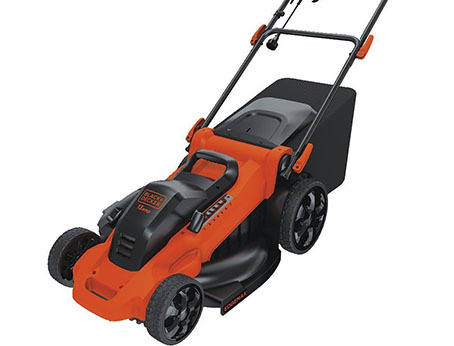 This Ariens mower has some strong features, but its inconsistency and foreign made engine (says Ariens engine, but manufactured by Chinese company called Lonclin) ultimately regulate it to last place. NOTE: Many of the top manual mowers are the same as certain self propelled mowers (SPM) minus the drivetrain of course. Anytime this happens, we will write “Refer to SPM” indicating that you should scroll up and read about the mower in the SPM category. Briggs and Stratton Engine: When working with a lower cc engine it is vital to have the best quality. This B&S engine delivers by maximizing the mower’s power, and allowing it to shred anything in its path. California CARB Approved: This mower meets the emissions requirements set by the state of California. Mowers spew so much toxicity into the environment that it is encouraging to see one trying to keep the planet safe. Rear bag technology: This is a seriously over engineered bag. It even includes an air filter to prevent allergens from entering the user’s system. Craftsman is a name that has been synonymous to quality tools for many Americans. 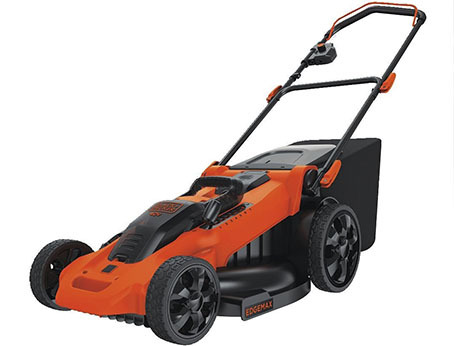 This push mower is affordable and packed with the standard features you need. It may not be the most glamorous, but it accomplishes what it needs to. Who this is not for: Someone who can afford to purchase the more expensive Honda mower. 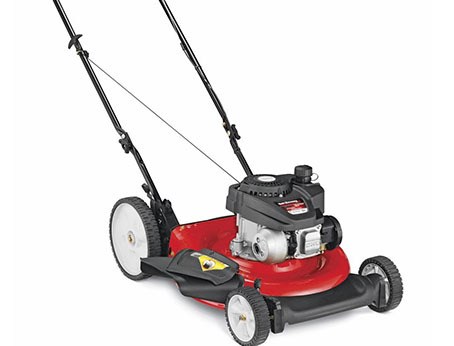 140cc Powermore engine: This is the lowest power engine available, because of this there is a higher chance that the engine will turn off while mowing. Some users report this happening when larger items are mowed over. Additionally, this is an imported Chinese mower. 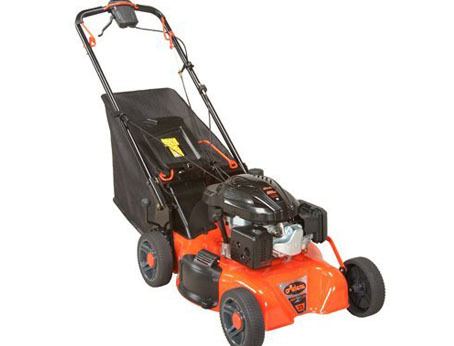 Maneuverability: The mower has large wheels, height adjustment, and is very light (62lb). These attributes are especially important in a push mower, where no drivetrain assistance is provided. Affordability: These mowers can be found around $200, and are one of the best values on the site regardless of category. Yard Machines is another made in America brand under the umbrella corporation of MTD Products. 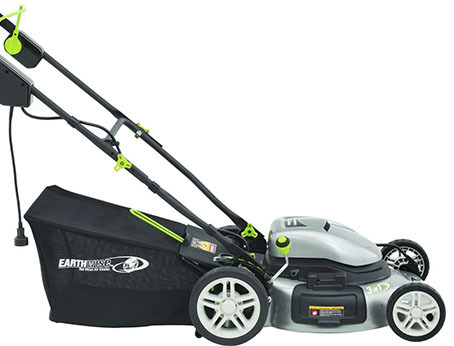 The mower featured here is a compact, quiet, and affordable machine. Who this is for: Someone who wants a high quality, no-frills machine that’s the best value for the money. Who this is not for: Someone who needs a more powerful machine, or wants more features. 160cc Honda engine: This is the same top-quality Honda engine we have mentioned in other mowers. At 160cc this mower will handle the majority of lawn problems with ease, and its Honda pedigree means it will be extremely durable. Warranty Issue: There are 2 warranties: 1 for the Honda engine (Honda warranty) and 1 for the rest of the mower (Husqvarna warranty). This can pose problems if a defect arises in the engine (Honda warranty), but Honda blames it on the transmission (Husqvarna warranty). The owner will have to argue back and forth between the two companies until one of them accepts the blame, and fixes the problem. This issue may never occur, but we felt it was worth noting. High Rear Wheels: The extra large rear wheels make the mower easy to push and steer. Divets or other imperfections in the surface of your lawn will be glided over effortlessly. This Husqvarna mower is chock-full of features, but we opted to place it at the bottom due to their warranty policy and the fact that several users received defective products right out of the box. Otherwise this is a solid candidate for best push mower. Who this is for: Someone who wants the superb quality of a Honda engine without the steep price. Who this is not for: Someone who is not willing to wade through warranty disputes in the unlikely event that a problem arises. NOTE: All electric mowers featured below are manually propelled. Electric mowers are so light that the absence of a self propelled feature does not pose an problem. Dual Batteries: The mower holds two batteries that power the mower for up to 70 minutes (time varies based on lawn condition). These batteries are 40v each, so power won’t be an issue unless you are cutting coarse/tall/wet grass. Unlike most mowers with only 1 battery, you won’t need to switch batteries half-way through your cut. Additionally, the long runtime means you won’t have to rush to cut your lawn before time runs out. 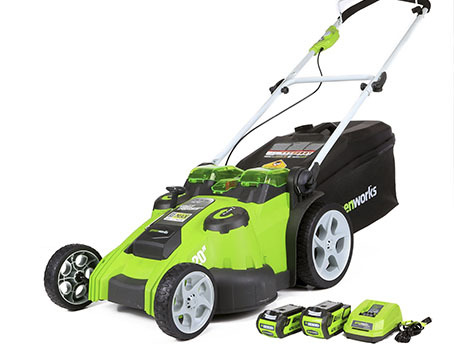 Smart Cut: The mower adjusts how much power it needs to use automatically. It senses the thickness of the grass, and will determine whether to use more or less power. Safety Key: The mower features a removable key which acts as a safety. When the mower is not being used the key is taken out, and with the key removed the mower cannot be started. This ensures that no accidents happen to children or pets if they try to turn on the mower when in disuse. 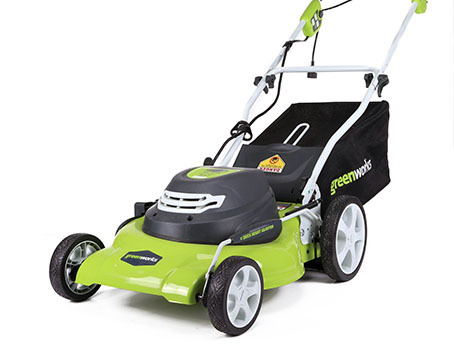 This mower is produced by a company called Greenworks, based in Europe. They produce a line of environmentally friendly lawn care machines with advanced features. 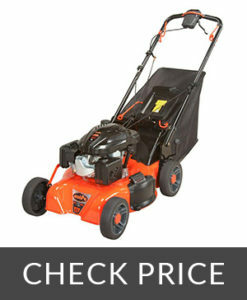 This mower is one of their best sellers and is our top pick for electric mowers. Who this is for: Someone with a larger lawn who wants a great all around mower with some innovative features. Who this is not for: Someone who needs more power to cut tougher turf. 3 lawn clipping discharge options: The mower allows the user to either mulch, bag, or side discharge lawn clippings. This is a popular feature on gas powered mowers that has been brought to electric. EdgeMax deck design: The mowing deck is structured in a way that allows you to cut right up to the edge of the fence providing a clean cut. 6 setting height adjustment: The mower’s cutting height can be set from 1.5 inches to 4 inches high. This gives you the ability to customize the mower to your lawn. The Black and Decker is a solid runner up. Although it may not have as many bells and whistles as the Greenworks, it performs its job effectively. Who this is for: Someone with a small to medium sized lawn (takes 30-45 min to cut) who uses multiple clipping discharge methods. Who this is not for: Someone who takes longer than 45 minutes to cut their lawn. 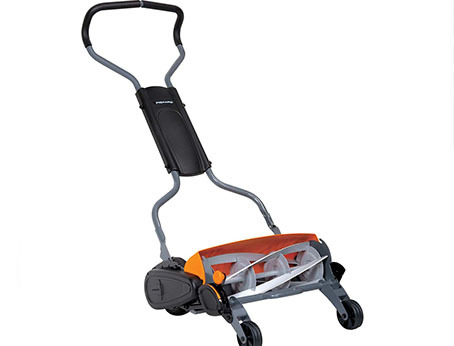 Convenient Storage: The mower can be folded and stored upright. There are no fluids like there are in gas mowers, so leaks/dripping is not an issue. Headlights: The LED lights on the front bumper of the unit allow you to cut the lawn in the evening when visibility has been reduced. This is a great feature, because the temperature is a lot cooler in the evening, so the task of mowing becomes less painful. Electric products, whether they be mowers or cars, have a reputation for being weak. EGO+ has set out to prove this stereotype wrong with their line of overpowered (56v) mowers. Who is this for: Someone who needs a powerful mower, and has a small to medium sized yard. Who is this not for: Someone who has an easy to cut yard (no tall grasses/rough patches). Brushless motor: A brushless motor is more energy efficient, and allows the mower to perform better and last longer. Brushless Motor Explained: Whereas a traditional motor will always operate on max power, a brushless motor consumes power based on activity being performed. In other words, if the Sun Joe is cutting long grass it will use more power than when it cuts short grass. 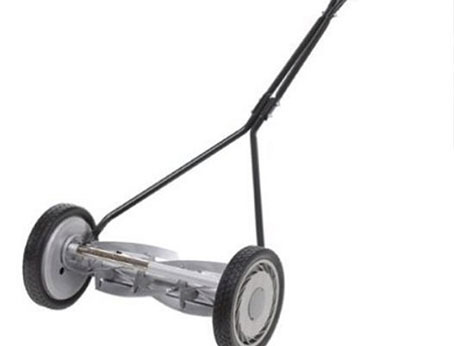 Incredibly Light: The mower weighs only 33lb making it one of the lightest electric mowers available. The extreme lightness compensates for the fact that the mower is not propelled, and makes the mower a breeze to operate. ETL and Energy Star certified: The Energy Star certification means that the product uses less energy than required by federal government. The ETL certification means that the product has met US safety requirements and is safe. Although the absence of these labels does not mean a product is unsafe or inefficient (they could just not have decided to get certified), the fact that Sun Joe company decided to go through the process to obtain them speaks volumes about the character of their company. Sun Joe launched in 2009 as a sister company to Snow Joe. As you may have guessed, like EGO and Greenworks, Sun Joe develops environmentally conscious outdoor tools. Thankfully for consumers, their Mow Joe mower is also budget conscious. Who this is for: Someone who wants a durable mower that is lightweight from an honest company. Who this is not for: Someone who needs a more powerful mower, or has a large lawn. Power/Quiet mode: There are 2 settings: Power and Quiet. Quiet mode is intended for short, dry, easy to cut grass. While in Quiet mode the mower can run for up to 1 hour. Power mode is intended for the exact opposite: tall/wet grass. The only downside to power mode is decreased battery life (approximately 45 minutes). Clippings Disposal: The mower is equipped with a mulching blade that finally pulverizes grass. Additionally, it can handle clippings by either mulching, bagging, or side discharging. 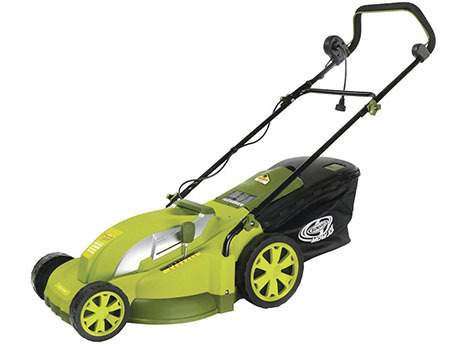 Accessories: The mower comes with a mulch plug and a side discharge chute (along with 36v battery and charger). WORX did a good job including the attachments most commonly used. 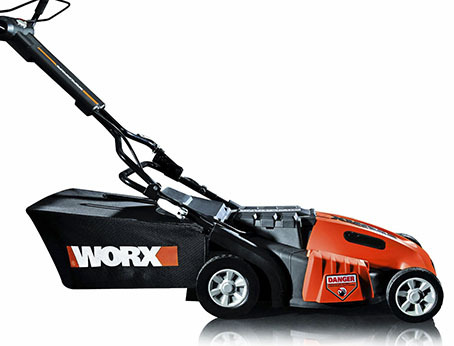 You may have seen advertisements for WORX 3 in 1 trimmers on TV, but WORX also manufactures an innovative mower. 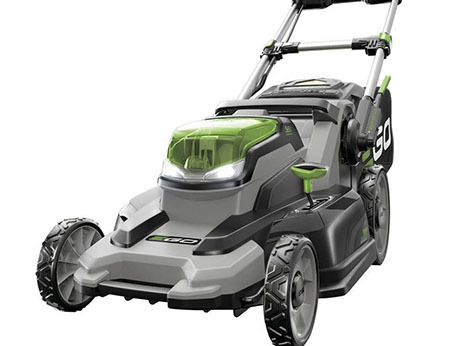 The mower comes in at 5th place because of some durability concerns, but overall introduces some novel features for mowing the lawn. Who is this for: Someone who wants a mower that is customizable to their personal mowing situation. Who is this not for: Someone who needs more power, or a longer runtime. NOTE: Many of the top manual mowers are the same as certain battery pack mowers (BPM) minus the inclusion of a cord of course. Anytime this happens, we will write “Refer to BPM” indicating that you should scroll up and read about the mower in the BPM category. Comfort V Handle: An ergonomic handle may seem trivial, but if you mow a lot you will appreciate this feature. The padded handle helps take away some of the vibrations from the machine, and its gentle contours facilitate better pushing. Single level Height adjustment: One brightly colored level controls the 6 different cutting heights. This makes it easy to change your preferred lawn height settings. Easy On/Off mulch plug and bag: Unlike other mowers where it can be difficult to remove the bag/plug, for this unit you simply move a lever and pull. No more violent fights with a jammed bag. Earthwise started out as American Lawn Mowers in the 1890s from traditional reel mowers it finally graduated to electric mowers in 2006 and rebranded itself as Earthwise. The mower below is a testament to the American ideal of perseverance, and it cuts grass pretty well too. Who this is for: Someone who appreciates a company’s long history, and needs extra comfort in their mower. Who this is not for: Someone who wants a more powerful mower. Caster wheels: These wheels allow the mower to make tighter turns and easily reverse. This extra maneuverability will be especially helpful on uneven terrain. Foldable: Like some other mowers we have covered this one can be folded and stored vertically. A small footprint in the garage means more space to put other tools. Steel Cutting deck: This premium cutting deck excels at mulching, and reflects WORX premium positioning considering that they could have opted for plastic. 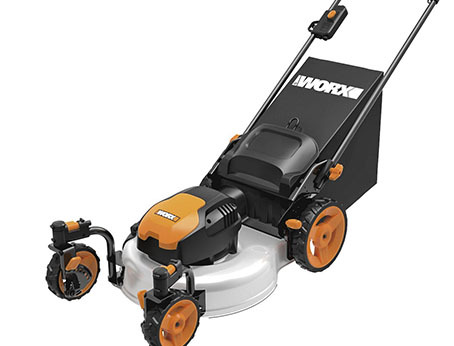 We discussed WORX earlier, but this mower is interesting because it has caster wheels (same wheels as a shopping cart). These wheels coupled with some other design decisions make the mower worth looking into. Who is this for: Someone with a bumpy yard who needs a versatile mower. Who is this not for: Again this mower is not for someone who wants/needs a more powerful mower. Rust resistant handle: This mower is made of heavy duty materials, and, in order to preserve both the integrity of the metal and its appearance, Great states powder coated the handle to prevent rusting and maximize longevity. Heat treated blades: Heat tempered blades last longer, stay sharper, and maintain a healthy level of flexibility. Since sharp blades are vital to a bladed mower this unit uses the best. Ball bearing wheels: The wheels contain bearings, so they move over grass smoothly. These are not the run of the mill plastic wheels found on electric/gas mowers; they are top-notch components engineered for comfort and durability. Our top pick is from a sister company to Earthwise-Great States. They have been producing reel mowers for centuries and this one is a testament to their resiliency and craftsmanship. Who is this for: Someone who wants an all around great mower with a durable design. Who is this not for: Someone who can afford our #2 pick. Inertia drive: The blades on the mower are large diameter, and the mower delivers 50% more power than similar mowers. StaySharp TM cutting system: The blades are contactless, so friction is reduced. Also, the tough construction means that even difficult to cut Southern grass is sliced with ease. Easier to Push: The mower is 30% easier to push than other similar mowers. Our 2nd place pick is from a brand known for their scissors and crafting supplies. They applied their knowledge to develop their mower which contains some pretty advanced technologies for a non electric mower. Who this is for: Someone who wants an easy to push yet powerful mower. Who is this not for: Someone with a bumpy yard. Some reviewers say mower begins to break down if mowing over uneven terrain. Contact free cutting: The blades of the mower do not scrape against each other (like a scissors does) as they cut the grass. This means the mower is extremely quiet, and the blades will be maintained longer. Height adjustment: The cutting height is adjustable, so you never have to cut your lawn twice in a row to get it down to size. Detachable/Foldable handle: The handle folds for easy storage. It is also detachable, which makes transportation (in a vehicle especially) easier. Our 3rd place pick is also the most beautiful reel mower we have seen. The blue and red design is complemented by some excellent features. The only thing holding the Gardena back from #1 is its price. Who is this for: Someone who can afford the best mower available. Who is this not for: If you don’t have big budget then stick with the Great States. It provides a great cut at half the price. Blades made of Alloy steel: These are heavy duty industrial blades that will have no problem slicing through your lawn. Padded Handle: We have discussed the benefits of a comfortable handle, and they all hold true for this mower. Sometimes the mundane comforts are the most appreciated. Treaded, High-Impact wheels: These wheels grip the lawn with their treads which provides extra stability. Additionally, they can tolerate bumps and rough surfaces. 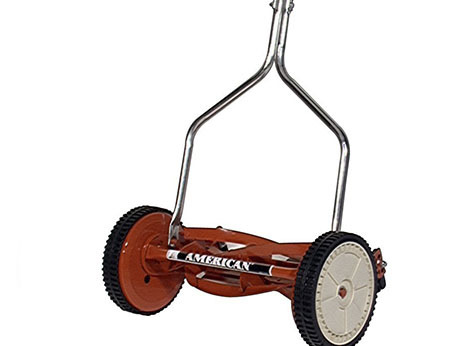 Our fourth place pick is the vintage inspired American reel mower. This mower is on the small side, but has top quality components and a great red hue. Who is this for: Someone who needs a rugged yet comfortable mower for their lawn. Who is this not for: Someone who has an even surface lawn might enjoy the features of one of the above recommendations better. Extended Spoiler: With many reel mowers grass clippings end up all over the user’s shoes. The extended spoiler prevents this from happening. Sealed ball bearings: Other wheels have ball bearings, but because these are sealed ball bearings they are resistant to corrosion from water and grime. The wheels will last longer, and provide a smoother ride. Comes fully assembled: Other mowers requires assembly, but this one arrives fully assembled. You can open the box and get mowing. Our next recommendation is German engineered by a company called Brill. While a great mower overall, some issues with the product’s durability decrease its position. Who is this for: Someone who wants to mow without getting excess grass on them. Who is this not for: Someone who wants a more durable machine (there are some fragile plastic parts). Where to Buy a Lawn Mower? Lawn mowers are readily available in most brick-and-mortar hardware stores such as Home Depot, Lowes, Menards, and Sears. 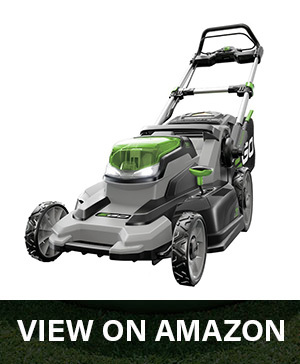 Although purchasing from a retail store allows you to get your mower immediately, we encourage you to highly consider purchasing from an online retailer such as Amazon. Greater selection: Physical stores have a limited stock of lawn mowers, and if you are searching for a specific model you may have to make trips to multiple stores-sapping both your time and energy. Online marketplaces offer a wider selection than any appliance store and you can browse from the comfort of your home. Cheaper Prices: If you are looking for the best value lawn mower for your money then chances are you’ll find it online. Prices can be markedly lower online due to multiple vendors selling the same product. It is also common for sites like Amazon to offer deals that further reduce the price. Finally, the ability to compare prices/features of hundreds of different mowers side-by-side is invaluable. Customer Reviews: Unlike the employees at big name retailers who may emphasize a mower’s strengths and overlook its flaws, Amazon provides thousands of reviews from everyday people. These reviews provide you with a comprehensive, truthful look at how the product holds up in day-to-day usage. Best Lawn Mower Reviews – Watch Out! Whether it is your first time buying a mower, or you just want to ensure your next mower is better (or just as reliable) as your first, consider the following criteria to find the best lawn mower that fits your specific needs. Follow these guidelines, and you will decrease the likelihood of getting scammed by a bad mower/one unsuitable for you. Power: A lawn mower’s power lies in the size of the engine for gas powered mowers or the voltage of the battery pack in electric mowers. For gas mowers an engine size of 140cc or less is on the weaker end while 180/190cc is on the powerful side. For electric mowers 20 volts is the lower end of the spectrum and 36+ volts is the general cap for high power. 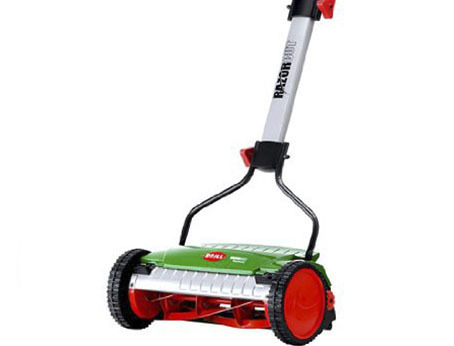 If you have to cut tall or wet grass on a frequent basis then you will need a higher powered mower (180+cc/30+V). For standard lawns without many weeds or hard to cut grasses a low power motor (140cc+/20+V) will suffice. If you have a lawn you can mow in 30-45 minutes or less (small lawn) then an electric mower will be quieter and more energy efficient. If you have a larger lawn (takes 60+ minutes to mow) a gas powered mower is a better option, because it will not run out of gas during the job. 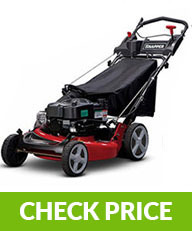 Click here if you need more information regarding lawn mower engines. Manual vs. Drive: Lawn mowers can either be moved exclusively by the user, or they can have a drivetrain that propels them along. Manual mowers work if your property is relatively flat, but for sloping lawns, a wheeled drive is a must. Finally, there are three configurations of wheeled drive: front, rear, and all wheel drive. Front is generally the better option, because you can use the rear wheels to pivot the mower for tighter turns. Rear wheel drive is only worthwhile if you live on a hill (they give more uphill power than front wheel). All wheel drive is more of a premium feature, but it does help for the most extreme of slopes. Ignition Method: Everyone is familiar with the traditional “prime and pull mowers” In order to start them you press a “priming button” multiple times, and then pull the “pull-cord” until the engine starts. There is also electronic ignition; you twist a key and the mower starts. Pull and prime ignition can require repeated pulls of the pull-cord, and is more fidgety. Electronic ignition is reliable and effortless, but the feature will increase the cost of the mower slightly. Auto Choke: Lawnmower engines have a part called the “choke.” The choke regulates airflow into the carburetor (place in the engine where air is mixed with fuel). In cold weather the ratio of fuel to air must be higher, so the choke would be slightly closed to allow less air to enter. Once the lawnmower has started, the choke must be reopened to increase the amount of air. Adjusting the choke is a tedious task, so look for mowers with “auto choke.” As the name implies the mower will self-regulate the airflow to the carburetor. Mower width: The width of the riding deck indicates how large a swathe of grass will be cut in a single pass of the mower. Push mowers range from 14 to 22 inches, and riding mowers far exceed that. If you have a large lawn you will want to buy a wide area mower at the higher end of this spectrum (21-24), whereas a small yard requires less. Generally speaking, the maximum yard size for a push mower is 3/4 of an acre, and anything over this amount should probably be cut with a riding mower. Although it is entirely possible to cut over an acre with a pushing mower, we recommend riding mowers to save a sizable amount of time mowing. On our site we normally classify “small” as taking 30 minutes or less to cut, and “large” taking 45-60 minutes. Lawn Clipping Disposal: There are three different ways lawn mowers can dispose of grass clippings. 1) Mulching, a system whereby the clippings are finely ground and redeposited to the soil acting as a natural fertilizer. 2) Side discharge: clippings are propelled out of the mower onto the grass. The side discharge feature makes it slightly easier to cut taller grass. 3) Collection: clippings are collected in a bag attached to the rear of the mower. Bagging is helpful if you are concerned about the lawn debris getting on people/pets, or if you like keeping your driveway free of grass. 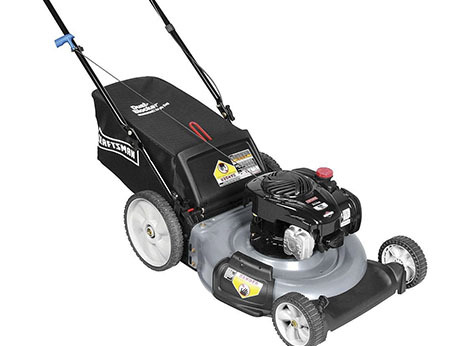 Ease of Maintenance: No lawn mower is completely immune to damage, and all mowers will undoubtedly require maintenance (oil/gas refill, battery charge). The best mowers have easily replaceable parts, and have easily accessible refill points for oil/gas. If you tried researching for a best lawn mower elsewhere, you may have been overwhelmed by how many different kinds there were to choose from. Understanding these types of mowers will allow you to discover which variety of mower is best for you. This category includes any lawn mower that is operated by walking behind the mower and pushing. 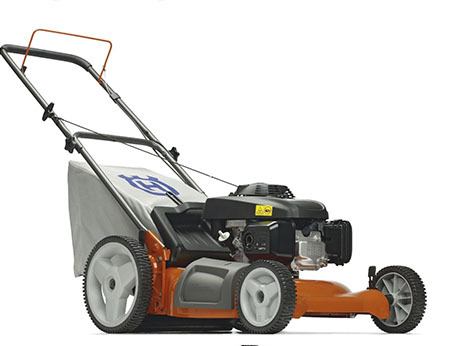 Self propelled mower: These mowers have either rear or front wheel drive. This feature allows the mowers to pull themselves forward. Pros: Self propelled mowers are great for bigger lawns, or for people who struggle to push a manual lawnmower. Cons: They are more expensive than their manual counterparts, and can have difficult to use drivetrains. Manual: Unlike self propelled mowers, manual mowers have no wheel drive. These mowers must be pushed forward by the user themselves. Pros: They are inexpensive, and lighter than their rear wheel drive counterparts. Cons: The user has to push the unit, which can be tiresome if mowing a large area. Electric: Simply put, a lawn mower that runs on electricity (via a battery pack) instead of gas. Pros: They are environmentally friendly, save money on gas costs, and are extremely quiet. Cons: Some may have less power, and short battery life which prevents them from having the time to cut large lawns. Reel: Fully mechanical mowers that have a rotating cylindrical blade. Pros: Environmentally friendly and the cheapest option available to mow with. Cons: Blades will need intermittent lubrication, and potentially yearly maintenance. Additionally, these mowers are only good for smaller lawns. These mowers are similar to lawn tractors in that the operator controls the mower while sitting on it. Pros: Fast and powerful way to cut as much lawn as possible in the shortest time. Cons: They are far more expensive than any push mower, consume a large amount of gas, and are noisy. These are autonomous lawn mowers that remotely cut the grass without human operation or supervision. Pros: You can relax while your lawn is cut for you. Cons: Setup can be difficult, and since technology is still developing the robots are incredibly expensive. NOTE: Riding and Robot mowers will NOT be covered in this article. For more information on these mowers use the navigation tabs at the top of the webpage. If you want more information regarding the history of each mower, click here. So there you have it, our top mower recommendations for 2017. 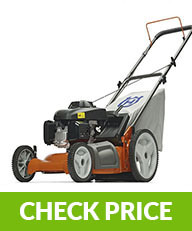 We hope you were able to find the best lawn mower from our in depth reviews. If there is anything else we can do to help don’t hesitate to contact us. COPYRIGHT © 2016 · BEST-LAWN-MOWER-REVIEW.COM, ALL RIGHTS RESERVED.